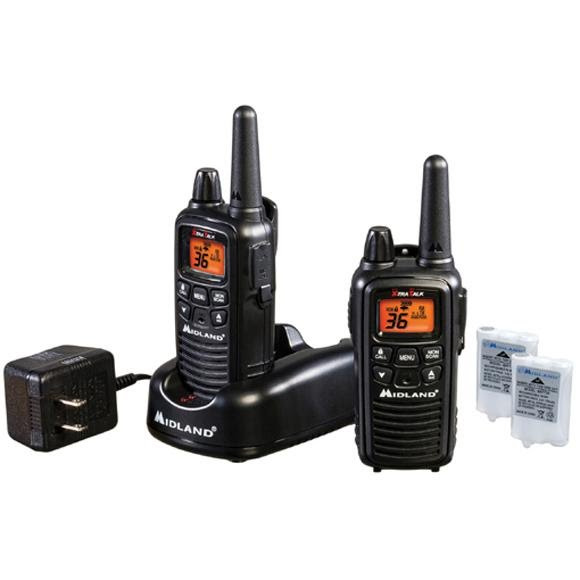 Midland's LXT600VP3 two-way radio includes a pair of 36 Channel GMRS Radios with up to 30 Mile Range. Dual power options with three 'AAA' batteries or a rechargeable battery pack make this two-way radio a flexible option. With NOAA Weather Alert and Weather Scan, the LXT600VP3 makes an excellent choice for your next outdoor adventure. Midland&apos;s LXT600VP3 two-way radio includes a pair of 36 Channel GMRS Radios with up to 30 Mile Range. Dual power options with three &apos;AAA&apos; batteries or a rechargeable battery pack make this two-way radio a flexible option. With NOAA Weather Alert and Weather Scan, the LXT600VP3 makes an excellent choice for your next outdoor adventure.